Eastwood is a Wandsworth Maintained Community Nursery School. Nursery education is provided by fully qualified teachers, assisted by teaching assistants and nursery nurses qualified in childcare and education. 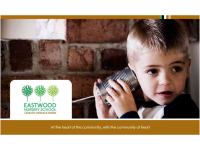 Eastwood Nursery School also has a small number of places for children with social communication disorders including autistic spectrum disorders (ASD) and for vulnerable 2 year olds. To get a place at the school the Council's published admissions criteria apply. Parents of children with a special need will need a referral from a health professional, eg, general practitioner or paediatrician or an education professional. The referral will then be considered by a specialist multi agency team. Find out how to apply for a nursery place.